For a while now I've been using Google Music as a kind of cloud-based backup for my music library. Except that it wasn't really a backup, because I couldn't easily retrieve all the songs I'd uploaded. In the event of a system failure, I'd have to download tunes in batches of 100. Bleh. 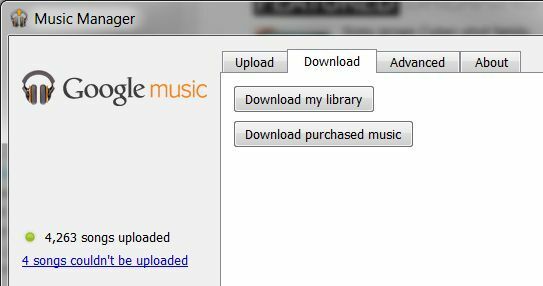 This requires Google's Music Manager, the Windows utility that automatically uploads your song collection from iTunes, Windows Media Player, or select folders to your Google Music account. If you're running it for the first time, keep in mind that the initial upload can take a long time--perhaps several days, depending on the size of your library and speed of your Internet connection. If and when the time comes that you want to download your library, just open Music Manager on your desktop, click the Download tab, and then click Download my library (or Download purchased music, if that's what you prefer). FYI, these options appear only if you've uploaded music from your PC first. Interestingly, when you download via the Google Music Web interface, you're limited to two times per song. But with Music Manager, there is no such limitation. So here's how my setup works. I have an iPhone. I sync various playlists to it via iTunes. I purchase most of my music from Amazon; its downloader automatically adds the new tracks to iTunes. The Google Music Manager detects those new tracks and uploads them to my Google Music account. Crazy, right? But the system works, and it's now a fairly bulletproof backup for all my music. Oh, and Google Music is pretty nice for streaming my tunes from the Web, too.